EZ Strip Professional Strength Textured Coating Remover tackles the toughest stripping tasks with a patented wet work system for safe dust free removal. Removes multi-layered paint, thick textured coatings, popcorn ceilings, painted wall and ceiling textures safely from virtually all surfaces. Duck Advanced Strength Duct Tape, Silver, 1.88 inch x 60 yds. With its professional grade adhesion, Advanced Strength Duck Tape Brand Duct Tape combines excellent holding power and shear strength with easy-to-tear application for quick repairs. It tackles a wide variety of uses including indoor and outdoor projects, making it the go-to duct tape for both professional contractors and DIYers alike. Whether you're sealing and waterproofing, bundling heavy materials, hanging plastic sheeting or protecting your surfaces, Advanced Strength grade tape is ideal for the job site, in the home or at the office. Dyna Patch is a professional grade, ready-to-use patching and spackling compound for repairing and smoothing cracks, holes, nail holes and splits in drywall, plaster, wood, wallboard, or metal doors. Ready to use, dries fast, and is shrink & crack resistant saving you both time and money. Excellent way to prepare your room, wall or door for painting and is a must have for any household. EZ Strip" All Purpose Remover is a fast acting gel stripper. EZ Strip" advanced non-toxic formula can be used effectively on virtually all surfaces. Remove all types of paint spill & overspray, graffiti, decals, markers & ink, gum, adhesive & glue residues, tree pitch, stickers, bugs & tar, and just tough sticky stuff. Gets the dirty jobs done! EZ Strip All Purpose Remover is a fast acting spray gel stripper. EZ Strip advanced non-toxic formula can be used effectively on virtually all surfaces. Remove all types of paint spill & overspray, graffiti, decals, markers & ink, gum, adhesive & glue residues, tree pitch, stickers, bugs & tar, and just tough sticky stuff. Gets the dirty jobs done! EZ Strip Textured Coating Remover 946 M/L Jug EZ Strip Professional Strength Textured Coating Remover tackles the toughest stripping tasks with a patented wet work system for safe dust free removal. Removes multi-layered paint, thick textured coatings, popcorn ceilings, painted wall and ceiling textures safely from virtually all surfaces. EZ Strip Textured Coating Remover 946 M/L Jug is rated 2.0 out of 5 by 1. Rated 2 out of 5 by Austenx from Makes a gooey mess I bought this to remove stucco ceiling. The instructions say it can be sprayed on, but this is a gel and it can only be brushed on. The 946 ml jug covered only a 6x10 ft area. After running out, I sprayed water on the rest of the ceiling to loosen it up. The water soaked side of the ceiling scraped off with ease and left no residue. The EZ strip side scraped off to a mush that made a huge mess. The drywall and primer on the ceiling peeled off and made the job so much more difficult. I would not recommend this product for your average stucco removal, instead, just use water. Will this product remove graffiti from an exterior concrete wall? If so what is the ideal application and instruction for doing this. 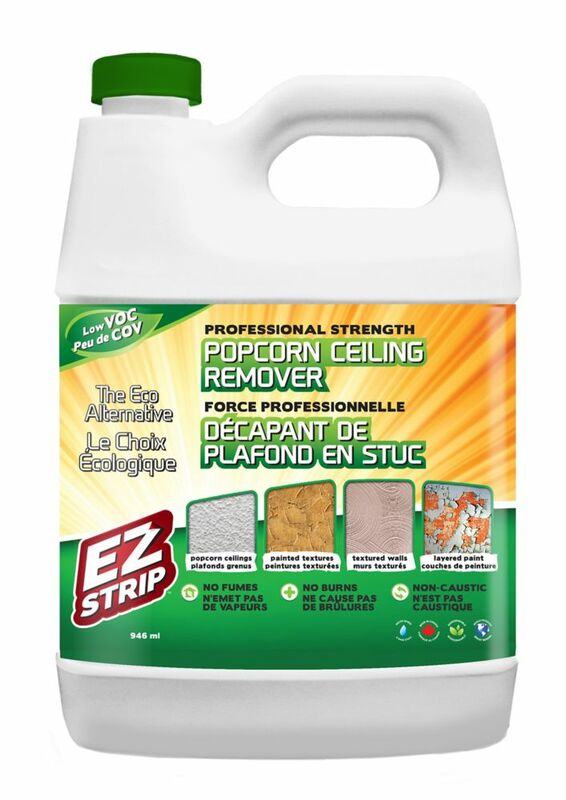 EZ Strip Textured Coating Remover is designed to remove interior painted drywall textures. For graffiti removal try our EZ Strip All Purpose Remover just spray on a thick even coat and let set. Set times will vary avoid direct sunlight if possible. For longer set times cover treated area with plastic to keep wet and working. When ready scrub surface clean with a stiff bristle brush and warm water. Pressure wash or rinse with a hose to finish.